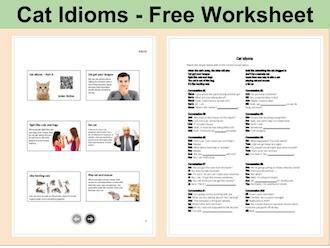 Listen to five idioms about cats and mice. Gwyn: I saw you at the party kissing another girl. Barry: What are you talking about? Gwyn: Look, I even have a picture of it. Gwyn: What”s the matter? Cat got your tongue! Ann: Do you have a brother? Bill: Yes, a twin brother in fact. Ann: Really, I had no idea. Bill: Yeah, we fight like cats and dogs, so we do hang out much. Mel: Who lives in that house on the beach? Sam: I am not sure. Some fat cat. Mel: It’s a lovely house. Sam: Yeah, it must be nice being filthy rich. Mel: Yeah, I’d love to be a fat cat someday. Kim: Do you like teaching young kids? Joe: Yeah, but some days it is really hard. Joe: Sometimes it’s like herding cats. Bob: I miss you. Can I meet you on Friday? Bob: What about Saturday or Sunday? Bob: Are you playing cat and mouse with me? Sue: No, I am really busy. We use this phrase when talking to someone who is too embarrassed to speak because they have been caught doing something wrong. When people fight like cats and dogs, that means they do not get along. We use this phrase to describe people that are always arguing. A fat cat is a very rich, poweful person who has a lot of influence in business or politics. A fat cat would be a person who often gets what they want because of their power. The phrase like herding cats refers to attempting to gather cats. Cats are very hard to catch so the phrase means to have a hard time collecting something or getting people to do something. When you play cat and mouse with someone, you tease them or play with them for your own amusement. You purposely make life hard for them just because you can. Fight like cats and .